The unpredictable Dragon-Scorpio is an ambiguous personality, but very interesting. Lives in accordance with their own beliefs, does not adjust to other people’s standards. And he has the right to this: the Scorpio Dragon is a self-sufficient person. It is not in his nature to ask for help, complain and swear fate. The life of this passionate, purposeful person is filled with various events. The fiery power of the Dragon gives him strength, and the stubborn character of Scorpio does not allow you to drop your hands and fall into despair. By nature has a strong energy, always at the center of everyone’s attention. According to the combined horoscope Scorpio-Dragon — a contradictory nature. It is difficult to understand, but it’s impossible to tame. Nature endowed him with a strong will, purposefulness and indomitable energy. The Scorpio-Dragon does not pass before difficulties, is always assembled and self-confident. Magically acts on others: his words not only do not cause protest, but are perceived as a direct indication of action. Scorpio-Dragon success is easy, in all cases he is lucky. Do not torment yourself with hard work, but simply enjoy life. He is full of optimism, is only determined to win, does not pay attention to minor troubles. But serious problems can spoil his mood for a long time. In a stressful situation, the Scorpio-Dragon ceases to control himself, becomes a rude and inhospitable person. Often people envy the Scorpio-Dragon, his strength, energy and courage are admirable. However, few know about the complexities with which he has to face. The constant internal struggle, outbursts of rage and aggression, increased emotionality are the causes of the unstable spiritual state of the Dragon-Scorpio. Every day he must prove his superiority, try not to lose the trust of others. People perceive him as an active, enterprising person who comprehended the meaning of life. They are ready to follow him, they believe him and even are afraid of him, but they rarely regret. Although this honest man deserves attention and care. Scorpio-Dragon needs protection or at least in words of support. 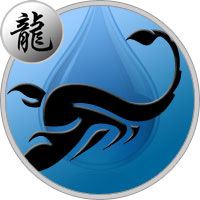 Ambitious Scorpio-Dragon bravely plans his future, methodically achieves his plans. Looking for people with similar views on life, he needs partners. He himself takes the role of leader, actively takes up the embodiment of ideas. He does not like uncertainty, we do not tolerate the weaknesses of other people. The Scorpio-Dragon is a demanding, tough, but just man. Kind and responsive to those who are trustworthy. Merciless to his enemies: he does not know how to forgive, he avenges himself to the last. Quite inventive, observant, so immediately reveals the weak points of the offender. He does not hesitate to demonstrate his power and authority, he does it with deceit without reprimand. But to close people are treated with great respect. The love horoscope for the Scorpio-Dragon contains quite optimistic predictions. This person can find his happiness if he becomes a little less demanding and selfish. Especially the lack of fans or fans of people do not experience this combination. Mysterious, sexually attractive Scorpio-Dragons fall in love at first sight. They are temperamental, generous and attentive partners. However, they do not tolerate objections, they always act in their own way. According to the family horoscope, the Dragon-Scorpio is aimed at long-term relationships. This strong and reliable person takes responsibility for the whole family. He is not afraid of hard-work, he is ready to work hard to provide his relatives with money. He does not tolerate objections, he severely suppresses any attempts to challenge his authority. Jealous, suspicious, so very demanding in relation to his half. The Scorpio-Dragon is a despot, but, fortunately, tries to work on himself. The ambitious Dragon-Scorpio dreams of a successful career. It’s early enough to start thinking about your future, responsibly to the choice of profession. He is not attracted to work with a low salary, marks on the position of the head. It is distinguished by a tenacious mind, insight, so it easily solves any problems. He can lead the work of a large team, but his relations with employees are always tense. Scorpio-Dragon rarely listens to someone else’s opinion. The Scorpio-Dragon wants to dominate and control the crowd, he likes to attract attention. Has a developed imagination, endurance and good intuition. It is quite capable of taking place in a creative profession or making a successful sports career. Although selfishness, explosive temperament can lead to failure. He does not know how to negotiate with people, likes to command and give directions. If he can curb his emotions, he will become a popular specialist. The powerful energy of the Scorpio-Dragon man has a magical effect on everyone, especially on women. It can be madly loved or hated, but it is impossible to remain indifferent to this strong personality. Active and energetic man does not see obstacles in front of him, boldly walks through life, does not feel fear at all and does not doubt his success. It is easy to achieve the position that deserves, usually holds a leadership position. He has a strong intuition, that is why he is quickly identified with the chosen one, but in romantic relations he feels uncharacteristic timidity. As a life partner, this is a reliable partner, but too quick-tempered and straightforward. Scorpio-Dragon woman is indisputably bright and attractive. Effective appearance, sharp mind, natural sexuality are the distinctive features of this charismatic person. She enjoys every day she has lived, does not restrain her feelings and emotions. Vividly reacts to any events, not necessarily personally relating to her. Do not remain indifferent to the problems and concerns of close people, the Scorpio-Dragon woman can always be relied upon. The truth for the friendship with her will have to pay in full: requires complete submission. Men must yield to it, patiently fulfill all the whims, while being solid, successful people. But still there are a lot of people willing to associate their destiny with her.